These brilliant orange flowers are so brightly colored they can almost seem to glow. 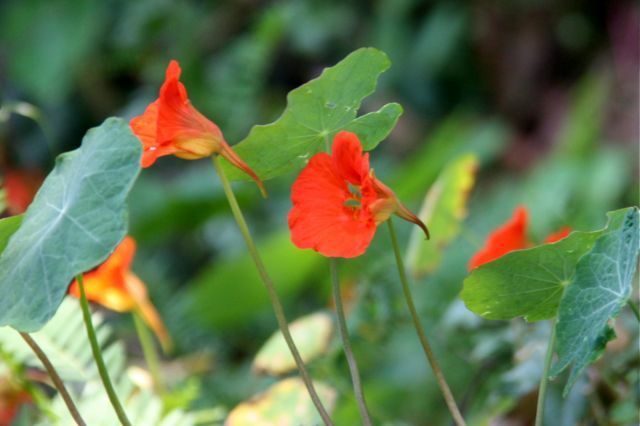 Nasturtium (Tropaeolum majus) is a garden plant that can sometimes escape into nearby forest–usually near the coast. It’s never seen growing far from human habitation. The flowers are large, edible and very beautiful. They range in color from buttery yellow to pale orange, and the upper petals often have dark stripes that run into the throat of the blossom. The three lower petals are dramatically fringed at the entry to the throat. Each flower has five pale sepals. The upper several sepals are fused into a long spur that extends backwards behind the bloom like a gnome’s cap. When they are happy, nasturtium plants can grow into dense mats, sprawling across the ground and climbing up fences, buildings and other plants. Fortunately they don’t appear to take over large areas, so gardeners don’t have to feel too guilty about planting this potential invasive. All parts of the plant are edible, and they have a sweet, spicy flavor that is somewhat like arugula. The seed pods are even spicier–some people harvest them young to use like capers, and others dry the mature seeds and grind them like pepper. I love to nibble the flowers raw or add them to salads. 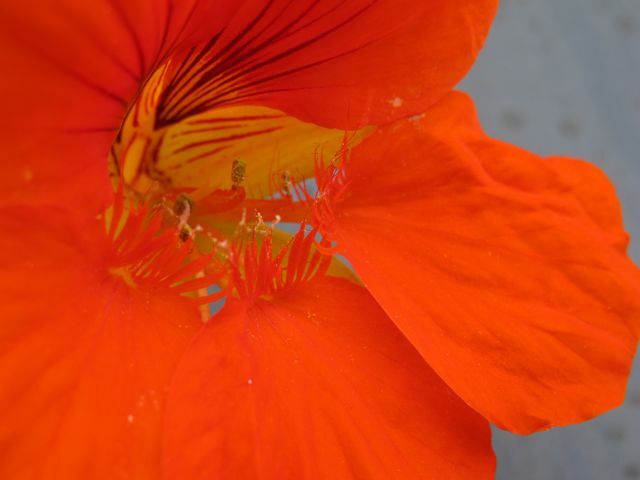 In the Andes, the nasturtium’s native range, they were used medicinally to disinfect and heal wounds, and to treat chest congestion. It is described as having properties that are antibacterial, antifungal, antibiotic and possibly even anti cancer.